Food Included: Around 10 items all up at 3 restaurants and 1 street vendor. Lots of kid-friendly food; Pork or Chicken Noodle Soup, street sweets & finger-lickin chicken, Isaan food in a garden restaurant, finishing at a relaxing family venue. Please only have the lightest of breakfasts, as we have a lot of food to sample. 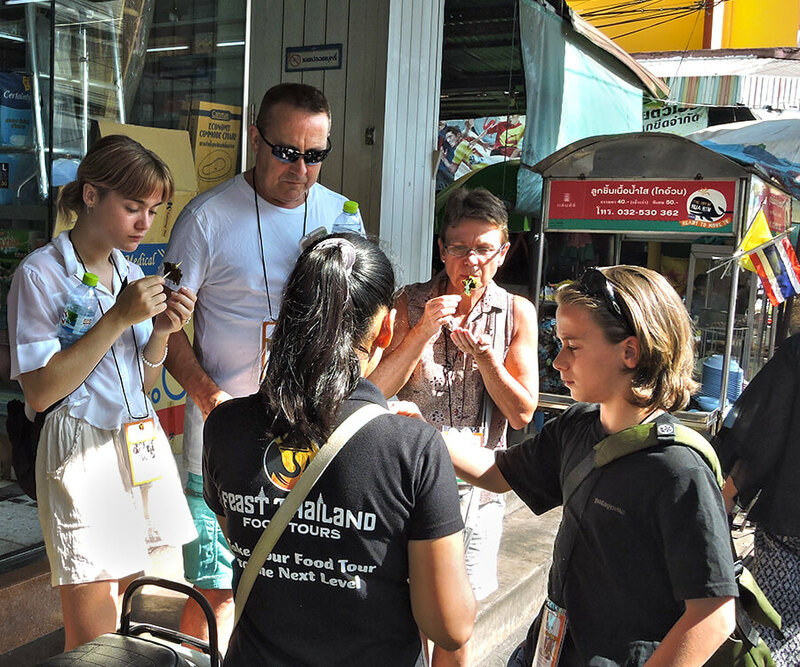 This tour is designed for families to explore and discover Thai food together in a way that is fun, yummy and educational. Learn to eat Thai food as a family; be able to use what you learn when you want to again eat Thai food as a family, either in Thailand or back home. Learn about the flavours of Thai food, how to spice it up for adults; how to reduce the heat for the kids. On this tour, you will be eating in some very local restaurants, where Thai families eat everyday, as well as to other venues that serve fantastic food that all the family can enjoy. This tour also includes some insights into Thai family culture and its relationship to food. As everyone loves noodles, we start the tour with Pork or Chicken Noodle Soup in a place where locals come to satisfy their appetites to start the day. Under their traditional 2 story Thai house there are 3 generations working. There are a steady stream of hungry customers dropping by for take away, or sitting at the tables slurping freshly made noodles suitable for all the family. We find street food vendors are a great way for families to experience Thai food, with everything from sweet to savoury snacks on offer. We find some roadside sweets being cooked the traditional way, as we sample Khao Lam ข้าวหลาม • Sticky Rice Cooked In Bamboo or Gluay Thot กล้วยทอด • Succulent Fried Banana! Our next destination is a beautiful garden venue where we taste dishes from one of the most vibrant of Thailand's regions; Isaan อีสาน • The NorthEast. Amongst other dishes, we will sample a Som Tam ส้มตำ • Spicy Green Papaya Salad. This dish is fast becoming Thailand's national dish, as it is available everywhere. This mixed platter is about sampling the many different flavours on offer. We finish the tour at a relaxing location both kids and adults will love. The place is custom made for families to unwind and enjoy some fabulous Thai food. Please Note: This tour requires a minimum of 3 paying guests to operate e.g. 1 Adult & 2 Children (6 - 11) or 2 Adults & 1 Child (6 - 11).